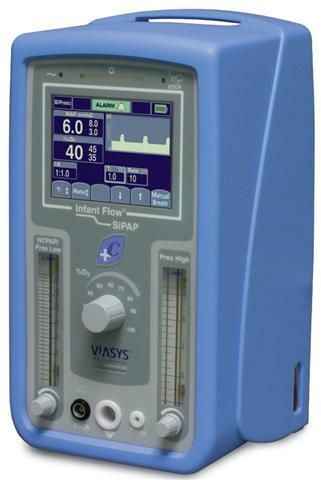 Save up to 80% on pre-owned Viasys Infant SIPaP ventilators. Infant Flow SiPAP provides NIV support for infants in the form of NCPAP & time triggered BiPhasic modes. Apnea back up is available in BiPhasic Mode. The LCD touch screen displays, Pressure time waveform graphics, patient monitoring, alarms for high and low pressure and FIO2 and up to 2 hours of backup battery power. NCPAP: With or without Breath rate monitoring/alarm. BiPhasic: Time triggered pressure assist are delivered based on clinician set I-time, rate and pressure criteria. Breath rate monitoring/alarm can be activated in this mode. Patented Infant Flow Generator – A fluidic device generates consistent infant NCPAP. Screen Lock – After 120 seconds of no screen input, the screen changes to a Locked Screen to prevent inadvertent changes. Activation of a high priority alarm unlocks device to allow access to controls.